If Jim Wohlford’s itinerant 15-year, 4-team career was a series of romantic relationships, the first of these affairs, with the Kansas City Royals, was The One. He met the Royals while still practically a kid, full of promise, and they’d grown up together. 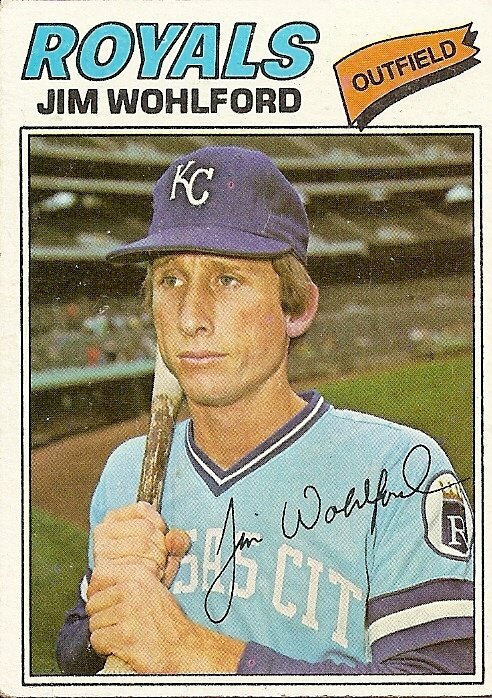 According to the back of this card, the California-born Jim Wohlford had even relocated to Kansas City permanently. Likewise, a profession of love and devotion had been made to him by the trade of fellow young suitor Lou Piniella so that he, Jim Wohlford, could claim left field for his own. From then on, if this card is any guide, Jim Wohlford led the league in forlornness, loosing demoralizing sighs as he drifted from one doomed, lackluster relationship to another, his unreliable bat on his shoulder like a hobo’s bindle. He tried first to salve the pain of being dumped by the Royals by consorting for a while with a young ripening barroom beauty, the Brewers, before leaving the Brewers just as the club was on the brink of blooming into boozy glory. Maybe any sweet days with the Brewers just reminded him of the Royals, and so were more pain than pleasure, which would explain the embrace, via free agency, by Jim Wohlford of a rainy, joyless three-year numbness with the San Francisco Giants, who eventually jettisoned him for someone named Chris Smith, a name so generic as to suggest the fictional. Last came the sad lingering rendezvous with the fallen foreign-accented former bombshell, the mid-1980s Montreal Expos, who returned Jim Wohlford’s forlorn muttering with cognac-addled rants about Mike Schmidt and Rick Monday and secession. That ended too, of course, as all things will, not long after Jim Wohlford watched from afar in 1985 as the only royal blue heaven he’d ever known won it all without him. You are currently browsing the archives for the Jim Wohlford category.